The Face on the Shroud of Turin is not that of a Man with caucasian or black features - it is clearly one of a Persian Middle-Eastern man who are predominantly bronze-colored. It is recommended you read "True-False Israelites" prior to reading this chapter to better understand the reason behind "The Persian Bronze-Colored" Messiah because you will have discovered that Hebrews were predominantly burnished bronze & "black" in skin color and originated from the land of Sumer(ia) where Abraham - the "father" of Judaism, Christianity and Islam - was born. Sumeria eventually gave rise to Persia which was an ancient empire located in West and Southwest Asia and at its height extended from Egypt and the Aegean to India. All the families of Shem - from whom the Messiah's bloodline comes from - were inhabiting the Mesopotamian-Sumerian valley after the flood. After the fall of the Tower of Babel, they become the Chaldeans, Assyrians, Lydians, Hebrew/Arab Semites and Persians. 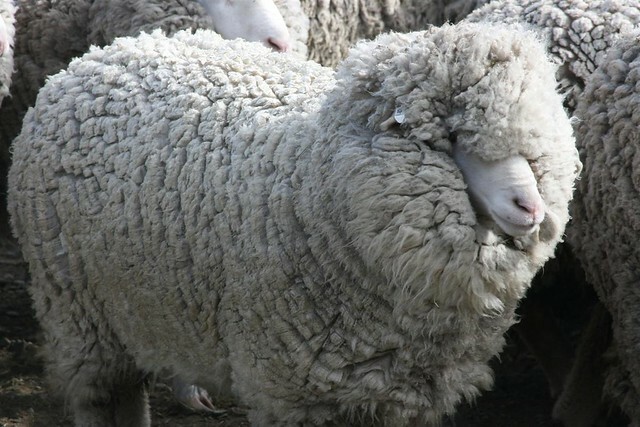 This common bloodline would obviously produce an appearance that would carry over to the Messiah which is very common to men of what is now known as Iran and India - modern day Persia regardless of which of the 12 tribes He or other men were from having burnished-bronze skin tones and and wooly hair as was the case for men of Judea and Egypt in their day. Suspend your programmed image of "Jesus" and any prejudice aside for a moment because the claim that the Nazarene Messiah was a Black-Persian man as was the Ancient of Days (the Creator) is based not on speculation, but scriptures from the Prophet Daniel and the Revelator John who describe Them to look in such a manner. The filtered Shroud of Turin confirms this description perfectly. the root word ‘adam (H 119) which means “red”, “dyed red” and “ruddy”. The similarities between the color of clay and the description of Adam’s color strongly confirm the revelation that Adam was a bronze- colored man. Why was Paul mistaken for an Egyptian? He, as was the true original tribe of Judea, were bronze-skinned as were Egyptians. *The Ancient of Days is the Creator Father and was before the beginning of days. * It is common knowledge that the voices of most black men have a deep baritone sound. Both the Ancient of Days - the Creator Father - and the Messiah are described to have hair white like wool that only Blacks have and burnished bronze skin color that Blacks and Indians have and made man - Adam - in Their image which National Geographic claims was a Black man (see above). The above scriptures from 2 prophets are NOT describing the wavy-haired, pale-skinned Christian / Hollywood "Jesus" nor of children or adults who are having "visions" of a blonde, European Christ at all - but an elderly black man. Now, keep this in mind for our next chapter - the Messiah's Missing Years which were spent in the Far East. What is the connection? He is said to have died there between the age of 80-120 - an elderly man which is precisely the appearance given by John in the Book of Revelation of the Lamb. 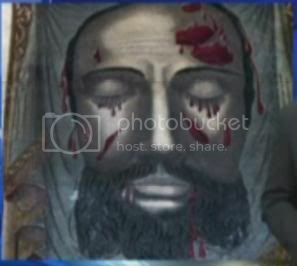 19th Century painting of the Veil of Veronica blessed by Leo XIII based on the cloth used to wipe the face of the Messiah before He was crucified depicts the face of a Persian Man on the far left & "Bronzed Persian" on the right. The Man in the Shroud with color enhancement. We find more pronounced Persian-like features. Note similarity to far left Veronica painting. 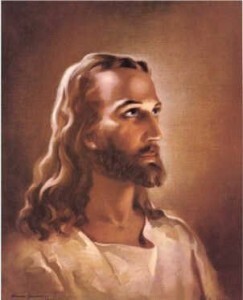 With bias towards depicting a "white Jesus" - no bronze-skinned wooly black-haired image found. What we definitely do not see above in either image is the caucasoid, European, Hollywood depiction of "Jesus" that has been so programmed into the conscience of almost every living being on earth (see sample of "Jesus Myth" images below). Nor do we see a man of negroid features that many black "Hebrew Israelites" claim. Using a bit of artistic license and imagination by blackening the beard and adding a head cover and more burnished-brown hue to the to the image to the right, we can more closely see a similarity to the image on the left. The blood marks on the top right forehead area and cheek indentations, the long, pronounced nose and the shape of the lip match. 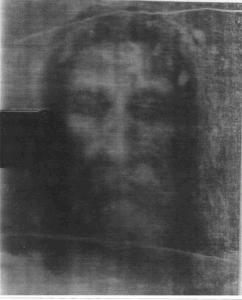 The painting on the left was made circa 1865 and the Shroud's positive image was not discovered till 1898 meaning that the painting could not have been "copied" off the image on the Shroud since it is nearly impossible to make out the negative image's markings. "Just as there were many who were appalled at him -- his appearance was so disfigured beyond that of any human being and his form marred beyond human likeness... He has no stately form or majesty That we should look upon Him, Nor appearance that we should be attracted to Him. 3He was despised and forsaken of men, A man of sorrows and acquainted with grief; And like one from whom men hide their face He was despised, and we did not esteem Him." Is it then any wonder that the Messiah was unrecognizable to those closest to Him after He appeared to them after the Resurrection? What we ultimately come across from the Nazarene Messiah in the Shroud and Veil of Veronica is a Man of burnished-bronze colored skin tone and wooly hair yet with the long pronounced nose we find in Persians commonly found in the Iran - India areas which coincides with the same area that Abraham, the father of Israel, originated from. The European, Hollywood, and Fantasy Depictions of "Jesus"
The above is what NOT to expect of the appearance of the Messiah at His second coming. If anything, this is what the Anti-Christ may look like. Could the Messiah's unexpected appearance as a Black Persian man be yet another test for mankind to accept Him this way at His 2nd coming which many will reject simply because His appearance is not what they've been conditioned-programmed to expect? If a "Messiah" appears looking white with wavy blonde hair and calls himself either Jesus (Christian Anglo name) or Yeshua (Talmudic Jewish name), this may well be the Anti-Christ False Messiah sent to deceive the masses who have been deceived to believe this is the true Nazarene Messiah. Whatever one takes from this conjecture, we should have an open mind about it and come to an acceptance that the appearance of the Son of God at the 2nd Coming of the Messiah will in most likely circumstances NOT be what the Christian/Hollywood version has "programmed" us to believe. If any of us live to see the 2nd Coming of the Messiah, do not be surprised to see an elderly dark complected man whose name is Immanuel (see "God's True Name" chapter - click here) who will appear looking similar to the image of the Man in the Shroud above.